"This is a favorite in our home, it works great for those who say, 'I don't like deer meat!' They'll have no clue that it's venison!" Preheat oven to 350 degrees F (175 degrees C). Lightly grease a roasting pan. Mix venison, sausage, onions, and cracker crumbs in a large bowl until well combined. Add the evaporated milk, eggs, barbeque sauce, salt, pepper, and half of the tomato sauce; mix until evenly combined, and let stand 15 minutes. Place onto roasting pan, and shape into a loaf. Bake in preheated oven for 30 minutes. Spread top with remaining tomato sauce, and continue baking for an additional hour, until the internal temperature reaches 180 degrees F (82 degrees C). Meatloaf made from ground buffalo and vegetables, wrapped in bacon. Delicious-- I halved the recipe, used ketchup for the tomato sauce, and baked it with potatoes and carrots. The flavor was great. I think this is the best meatloaf ever! It is soon to become a regular in my house. The wife is allergic to beef, so I decided to try this recipe as an alternative. 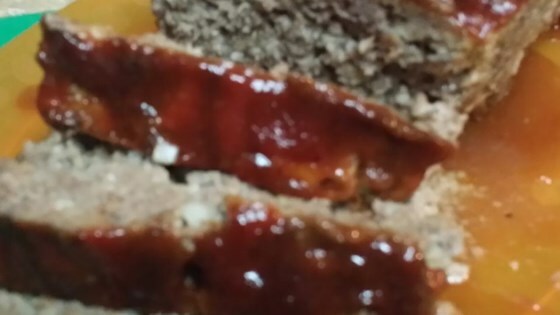 Have to say, without a doubt, this is THE-BEST meatloaf we've ever had. And the recipe is easy too. 5 stars! This was great! I just halved the recipe! My picky 3 yr old loved it so much he had seconds.